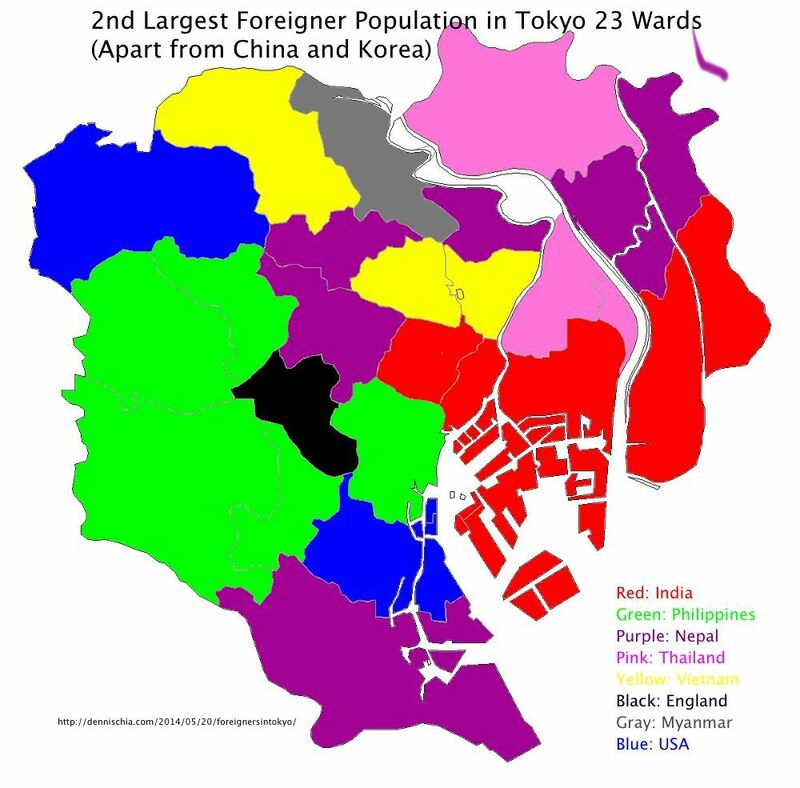 Everyone who lives in Tokyo would know that there are huge populations of Chinese and Korean immigrants, or naturalized citizens living in this metropolis. However, in recent years, there have been increasing numbers of immigrants from other countries, including Myanmar, Vietnam and Bangladesh. Tokyo has become more and more diversified with its increasing foreigner population. 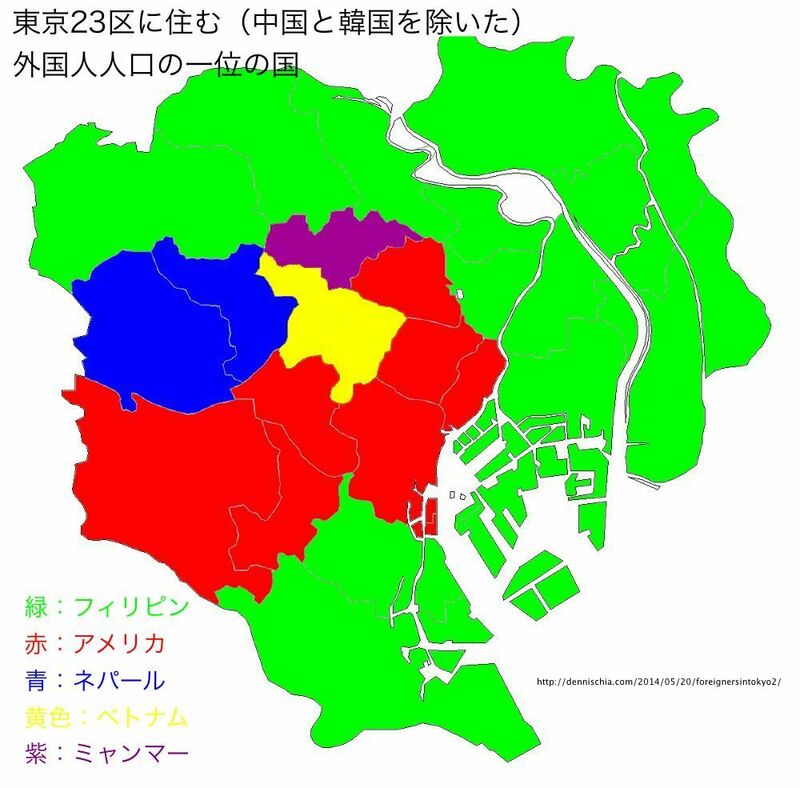 Let’s take a look at how they are dispersed across the 23 wards of Tokyo. This map shows the largest foreigner population (taking away people from China and Korea, since we already know they take up the majority). As you can see, migrants from Philippines and USA take up the bulk after Chinese and Koreans. Another thing to note is that the Filipinos take up the outer edges of Tokyo (Ota, Edogawa, Koto wards), whereas the Americans take up the central areas that include Setagaya, Shibuya, Meguro wards, where land prices are more expensive. 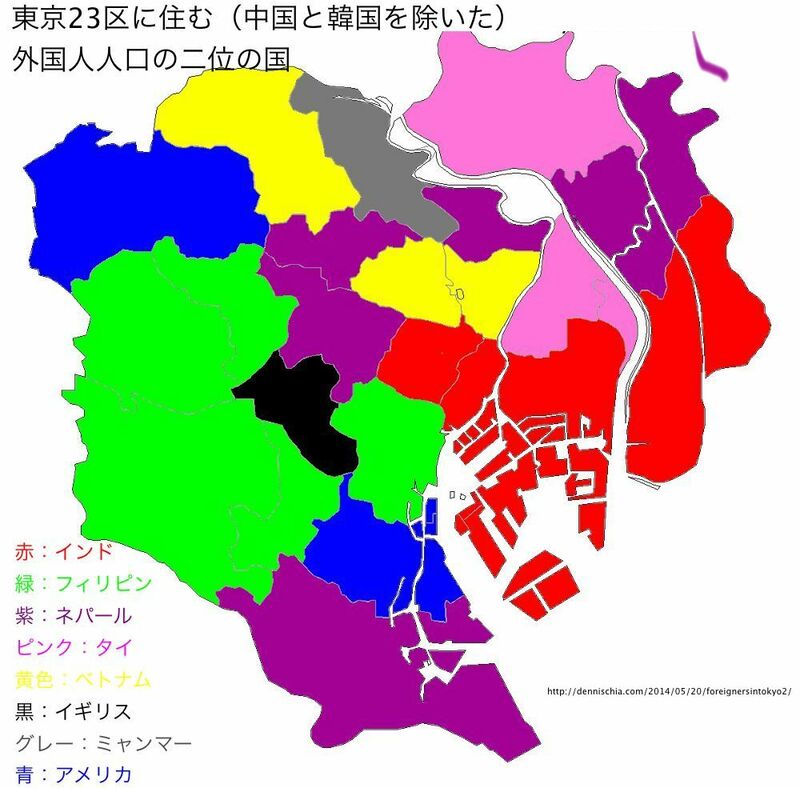 Also, Vietnamese take up the majority at Shinjuku ward, Burmese in Toshima ward and Nepalese at Nerima and Itabashi wards. How about the second largest foreigner population (apart from Chinese and Koreans)? There is a greater diversity and dispersion across the wards, and across the countries. As seen, there is a large Indian community (after the Chinese, Korean and Filipino communities) in the eastern part of Tokyo. Hopefully this gives you a clearer picture of the foreigner population in Tokyo! 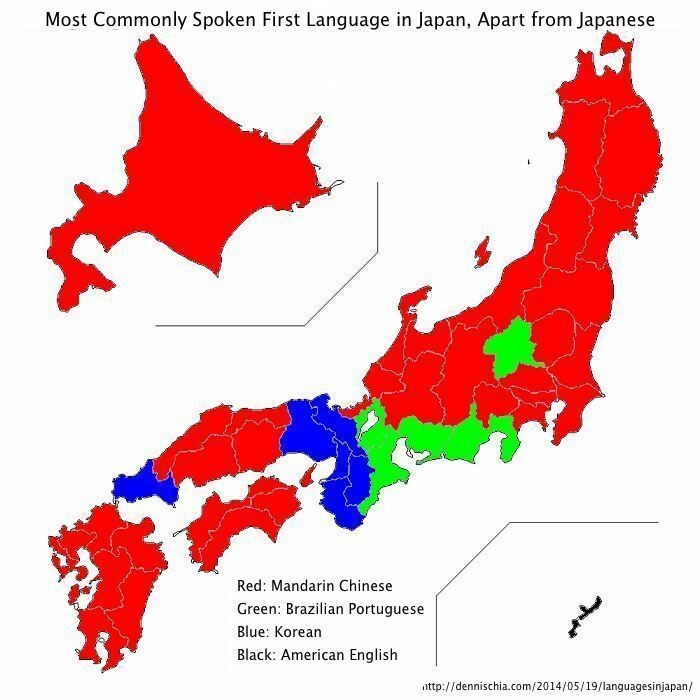 Have you ever wondered what languages are spoken in Japan, apart from Japanese? Japan has a small proportion of foreigner residents compared to the other countries in the world and due to its geographical location and relatively little interaction with foreign countries in history, Japan has developed a strong sense of identity and culture. Perhaps also with the influence of its education, most Japanese speak only Japanese language, and are notorious for their weakness in learning foreign languages. Nevertheless, we must not ignore the foreigners living in Japan, no matter how small the proportions are, as Japan opens its doors to immigration and tourism. Most foreigners who live in Japan gradually pick up the language naturally, as that is the only language spoken on the streets in most parts of Japan. With a history of exchanges and immigration flows from China and Korea, it is no surprise that Chinese and Korean take up the majority of the languages spoken apart from Japanese. With the end of feudalism in Japan in the late 1800s and early 1900s, poverty was rampant in the rural areas as people started to seek opportunities outside the country. The end to slavery in Brazil meant that there was a labour shortage at the coffee plantations, and the Japanese seized this opportunity and started to migrate to Brazil in throngs. The influx of Japanese migration to Brazil peaked between 1925 and 1935. In the 1980s, when Japan was experiencing the peak of its bubble economy, many Japanese-descent Brazilians started to return to Japan in waves, mainly to places in Aichi prefecture, where Toyota is situated. With regards to Okinawa, there should be no surprise to the large population of Americans residing there considering about half of the US military bases in Japan are in Okinawa. Let’s take a look at the ranking of countries of the foreigners living in the different parts of Japan.